Blinkbox Music: Tesco to launch streaming music service alongside Blinkbox movies and TV | What Hi-Fi? Blinkbox Music and Blinkbox Books are set to launch alongside Blinkbox Movies, as the Blinkbox brand, owned by Tesco, looks to offer a complete digital content platform. The new streaming music service will see Blinkbox taking on the likes of Rdio and Spotify, and giving Tesco a digital music rival to online stores such as Amazon. 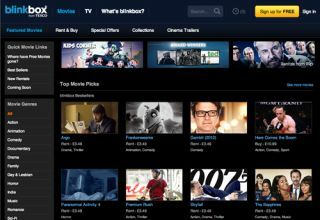 Tesco PLC acquired the Blinkbox brand, then a streaming on-demand movie service, in April 2011, before buying digital music platform WE7 in Juen 2012 and digital book business Mobcast in September 2012. Today, Tesco PLC announced new appointments that confirm the company's plans to lauch blinkboxmusic and blinkboxbooks (yes, that's how they're spelt) alongside Clubcard TV, "the free ad supported movie and TV service". Clubcard TV is a free streaming movie service for Clubcard customers that runs alongside Blinkbox's film service, which offers films to rent or buy on a pay-per-view basis without a subscription. Blinkbox has had tough competition from Lovefilm and Netflix, though both those streaming film services offer content on a subscription rather than PPV basis. Last year, Blinkbox signed a deal with Disney for TV and film content, having brought Blinkbox movies to more platforms including iPad and Xbox. Blinkbox is also on smart TV platforms. The new streaming services will see Blinkbox take on the likes of Rdio and Spotify in the world of music streaming, and online stores such as Amazon. No official details on the new Blinkboxmusic service have been released, however. A press release from Blinkbox confirmed the changes: "The new digital entertainment services, which complement the existing movie and TV streaming offering acquired by Tesco in 2011, will exist as separate entities united under the blinkbox brand "
Michael Cornish, CEO of Tesco Digital Entertainment, said: "The development of these new services demonstrates our total commitment to providing the best entertainment as easily as possible for our customers. They allow us to provide even more choice in how customers buy and enjoy their entertainment."